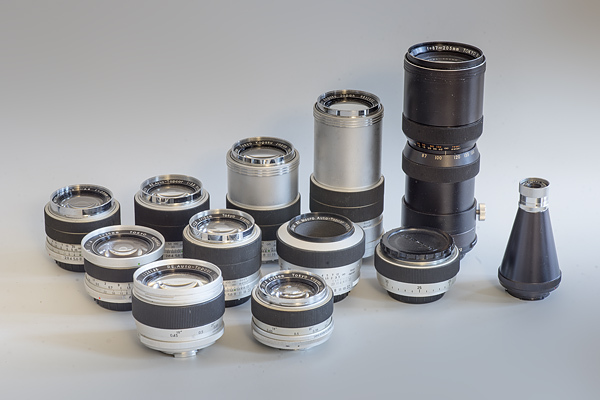 Topcor lenses are highly collectible items - especially the rare lenses such as the 1.8/85mm, 2/135mm and 2.8/300mm. Topcon has been introducing fast telephoto lenses years ahead of Canon and Nikon. Both the R 2/135mm as well as the R 2.8/300mm came to the market in 1957 (!). Sadly, several interesting constructions - among them a 4/7mm circular fisheye, a 7/1000mm reflex lens, and a 11/1000mm super tele with automatic diaphragm - were never released. Shown here the 2.8/28mm, 2.8/100mm, 3.5/135mm, 5.6/300mm, and 4.7/87-205mm (back row). Following in the middle row: 4/20mm, 2.8/10cm, 3.5/58mm Macro, adjustable macro spacer, and 3.5/35mm Macro for bellows. Front row: 1.4/5.8cm and 1.8/58mm standard lenses.